I got everything ready just in time for an online crop at Personal Scrapper. While I've enjoyed making layouts for the challenges during the crop, I realized that before I share those LOs, I had a few that I really liked from the past few weeks that I wanted to share. "Facts 7-15-09" used the July Personal Scrapper kit and a ton of misc. alphas/numbers. This page had a "by the numbers" theme. Mom of 2 allstar boys! This next LO tells a story that I had to get down for Kevin before I forgot it. I used my new August PS kit for this page. Journaling reads: Kevin was so excited to hear that his 7 year old allstar team would play in New Albancy, Indiana. He kept saying he was "going to the states"!! I kept trying to explain that even Kentucky was in "the states" and we were just going to ANOTHER state. He didn't really understand - I think he was too excited knowing he was going to play somewhere even his big brother never played. He had a great time and the tournament was a great experience for the whole team. 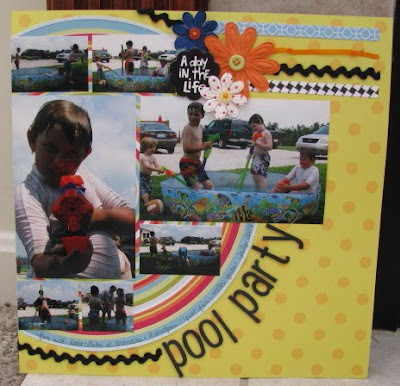 "Pool Party" is a scraplift of a layout by Heidi/anbzmom over at Personal Scrapper. I used the August PS kit for this LO. Finally, on my most recent trip to Archiver's, I picked up a set of Making Memories Halloween epoxy alphabets since I knew I had some of the coordinating paper line left. So the letters were simply get filed away, I pulled out the paper line some Halloween embellishments and made a page. I used a Jolee's set!!! 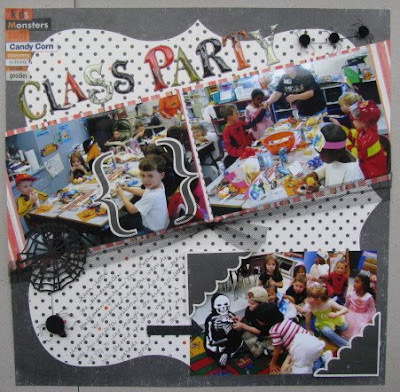 I actually used a lot on this page - MM wordfetti stickers, Heidi Swapp tulle, Junkitz glittered chipboard (arrow).